(SCHOFIELD BARRACKS, Hawaii) – The U.S. Army and the Hawaii Department of Land and Natural Resources (DLNR) conducted a joint airlift operation, Wednesday, to protect Oahu’s native plants and animals. 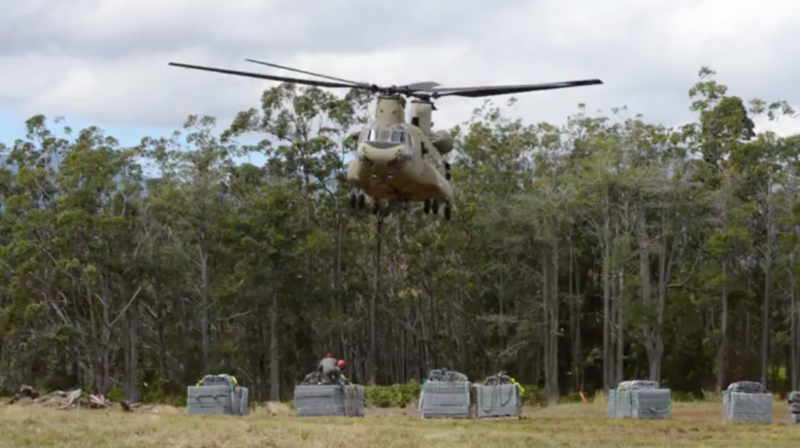 More than 95,000 pounds of fence panels, poles and associated equipment were carried from Schofield Barracks to the summit of the Ko‘olau Mountains, suspended beneath the belly of a CH-47 Chinook, the Army’s cargo transport helicopter. The materials will be used to erect watershed protection fencing in the Poamoho Forest Reserve and the Kaluanui Natural Area Reserve. According to DOFAW, these areas are home to numerous rare and/or endangered plants and animals. Fencing projects have proven successful in protecting these plants and animals from destructive invasive species, like feral pigs. By combining efforts, DLNR and the Army are not only improving support to these species, they’re also saving time and money. Normally DLNR would use a Hughes 500 civilian helicopter for this kind of operation. The Hughes 500 can carry approximately 800 pounds per load, at a cost of $1,000 per hour. By taking advantage of the Chinook helicopter’s heavy-load capabilities, the team can get the mission done much quicker. The Army’s Chinook can transport the materials in significantly less time: 10 trips, instead of the Hughes 500’s more than 120 trips. This translates to saving the State more than $120,000 in transport costs and anywhere from six to 15 days of labor. The Army also benefits because Soldiers use the operation as a training mission, enhancing their sling load skills with the unique cargo, and the natural resources staff improve protection for the species the Army manages in the Ko‘olaus. These species include the Hawaiian gardenia and the kahuli tree snail. This is the second fencing airlift the Army has supported in recent months. In December, the Hawaii Army National Guard supported a similar mission to the Ko‘olaus with two of their Chinooks. The U.S. Army’s Oahu Natural Resources Program carries out the Army’s natural resource responsibilities on Oahu,managing more than 40 threatened and endangered species. The program applies an ecosystem-based approach toensure Hawaii’s native species and their habitats are restored and protected, while also supporting the Soldiers’ needs forrealistic, sustainable training environments. For more information, visit http://go.usa.gov/cpHM3. The mission of the Hawaii Department of Land and Natural Resources is to “Enhance, protect, conserve and manage Hawaii’s unique and limited natural, cultural and historic resources held in public trust for current andfuture generations of the people of Hawaii nei, and its visitors, in partnership with others from the public and private sectors.” For more information, visit www.dlnr.hawaii.gov or at facebook.com/hawaiiDLNR.